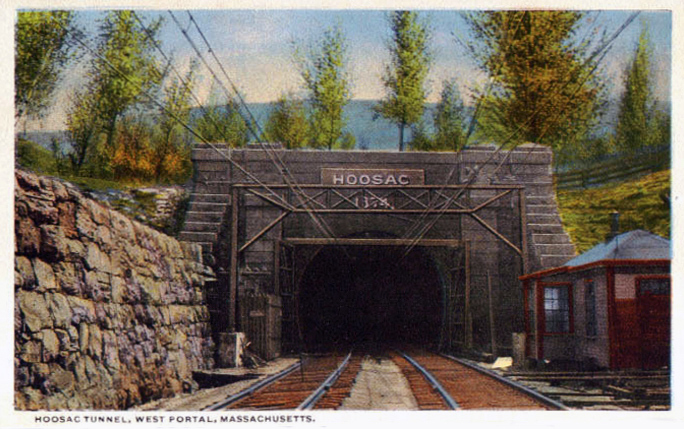 While the Hoosac Tunnel is often identified as being a part of the Boston & Maine Railroad it was not actually built by the well known New England line. Instead, its history dates back to the Troy & Greenfield Railroad, which was hoping to be the first system to complete a low-grade, through route from eastern Massachusetts to eastern New York by tackling the southern edge of the rugged Green Mountains (which is predominantly located in Vermont). The legend of the tunnel is due not only to its incredible length of over four miles but also the more than 20 years required to complete the endeavor. The project cost nearly 200 men their lives and a combination of unstable as well as incredibly hard rock resulted in many delays and cash flow problems. During the B&M era the tunnel was electrified for nearly 50 years. Today, while not nearly seeing as much traffic as it did 50 years ago the tunnel is still used by Pan Am Railways for freight service. 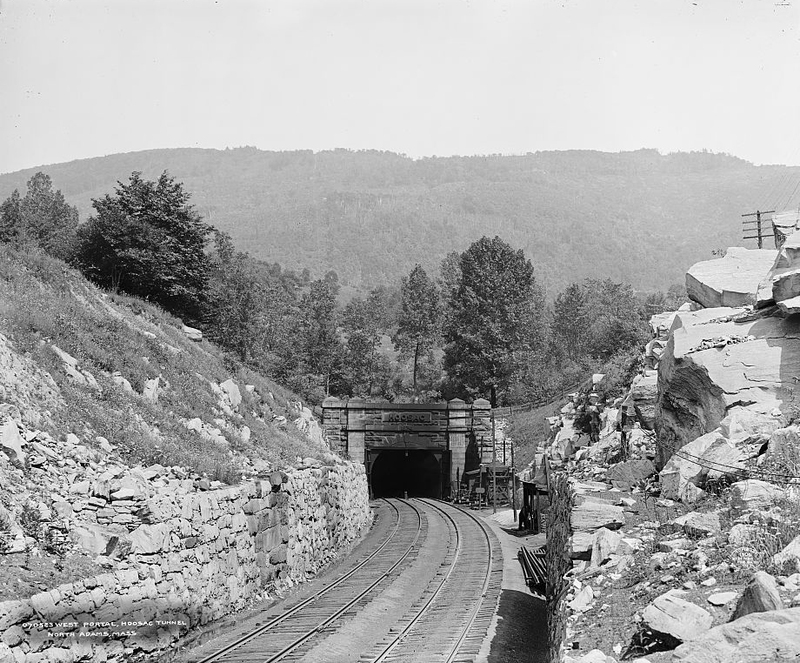 The first plans to construct what became the Hoosac Tunnel began as early as 1819, well before the railroad industry even began. At the time the canal systems were becoming hotly discussed and it was hoped to connect Boston and Albany, New York via waterway. Naturally, the cost for such a project proved too great and it died before serious planning ever occurred. 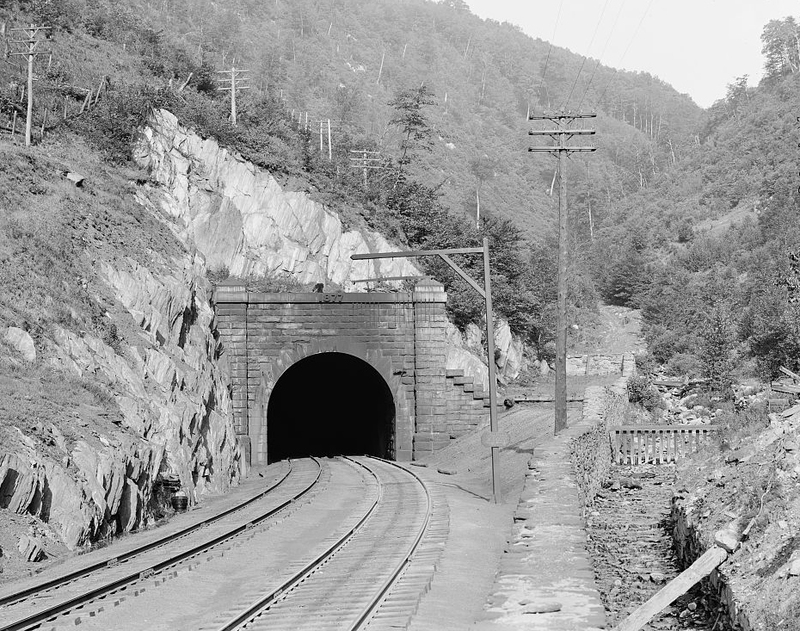 The idea of a tunnel as a railroad artery was first implemented in 1841 when paper mill owner Alvah Crocker began lobbying for a new route to be built through northern Massachusetts. His efforts were in response to the Western Railroad, a line chartered on February 15, 1833. It was an early predecessor of the Boston & Albany Railroad and would open a route from the Massachusetts state line to Worcester on October 4, 1841. Boston & Maine, "Route Of The Minute Man"
In conjunction with allying roads Boston & Worcester and the Castleton & West Stockbridge the three systems operated a through route between Albany, New York and Boston. Not only did these lines serve only the southern areas of the state but their route was also more circuitous than a northern connection through the mountains. A year later, in 1842 Mr. Crocker chartered his own company, the Fitchburg Railroad to serve not only the region in question but also his milling interests. This road connected Boston with Fitchburg by 1844 and after chartering the Vermont & Massachusetts Railroad reached Greenfield further to the west. In March of 1845 a through route was opened, a distance of roughly 100 miles. Looking to continue his advancement westward Mr. Crocker chartered the Troy & Greenfield Railroad. The T&G made a connection from the V&M at Greenfield and was created to reach Troy/Albany, New York via the southern tip of the Green Mountains, specifically Hoosac Mountain. At North Adams in the very northwest corner of Massachusetts, ground was broken on January 8, 1851 for the construction of Hoosac. The project was slated to cost $2 million and used a new mechanized stone cutter. However, it proved a poor and unreliable design. After five years and little accomplished the railroad hired noted engineer Hermann Haupt to continue the project. Despite Haupt's recognition and time working for the Pennsylvania Railroad there had been little accomplished by 1861 when he quit to work for the US Military Railroads during the Civil War. At the time the tunnel had just 500 feet completed on the east end and 1,810 feet on the west end. The railroad's efforts were also being hampered by the Western Railroad, which attempted to block the project fearing the competitive edge the Troy & Greenfield would gain if the tunnel was completed. The project was also being hampered by the rock itself which was a combination of soft, crumbly material and very hard gneiss and quartz. Without Haupt's services the operation almost literally shutdown. A year later, on August, 18 1862 the Troy & Greenfield fell into bankruptcy as it was unable to pay down its debt. 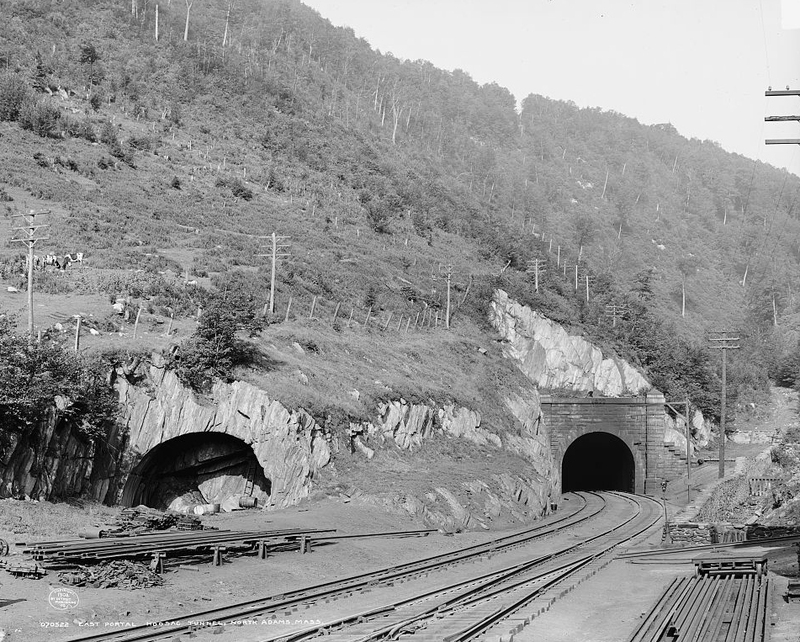 As a result, the state took over the line and decided to continue construction of the Hoosac Tunnel. In 1868 the legislature provided for $5 million to help see the project completed. By the early 1870s it was nearly finished and officially opened on February 9, 1875. By this time the tunnel had cost some $20 million, killed 193 workers, and was 4.75 miles in length; the longest such bore in the North America at the time. Three years after it opened the Fitchburg Railroad merged the T&G into its system and on July 11, 1900 the entire route became another division of the growing Boston & Maine Railroad. With more resources and understanding the tunnel's exhaust issues the B&M would electrify the Hoosac in May, 1911, which also helped to reduce operating costs since the motors were more powerful than the steam locomotives. The standard boxcab electrics used by the B&M remained in use for more than four decades. On September 5, 1940 the new Electro-Motive Corporation, a General Motors Division, tested their new model FT demonstrators on the B&M. For more reading about the history of the tunnel please click here. The railroad was thoroughly impressed as a the A-B-B-A #103 FT set carried an 83-car train that weighed some 4,500 tons between Mechanicville, New York and Boston in record time. A few years later in 1943 and 1944 the B&M purchased 48 FT units, or 12 A-B-B-A sets, and began the process of shutting down its electrification of the tunnel, which was completed by 1946. To compensate for the diesel exhaust the company installed a better and more efficient ventilation system. In 1957 the tunnel was reduced to a single track for better clearance (and remains so to this day) and by November 28, 1958 the final passenger train used the bore. Today, the while the route to Albany no longer sees the heavy freight use it once did it is still an important part of the Pan Am Railways system today.